MILWAUKEE, Wis., Aug. 1, 2011 (SEND2PRESS NEWSWIRE) — With the dog days of summer upon us, Big Bay Brewing Co.®, producer of hand-crafted specialty beers, announces the introduction of two refreshing all-natural gourmet sodas. The craft brewer, based in Shorewood, Wis., is unveiling its Pierjumper Twisting Citrus and Oh Buoy! Cherry Cola across Wisconsin this month. Pierjumper Twisting Citrus is a refreshing citrus blend and Oh Buoy! Cherry Cola is a hand-crafted cola with a cherry finish and a hint of spice. Both sodas feature old-fashioned quality with contemporary, natural flavors and are sweetened with real sugar rather than high fructose corn syrup. According to Jeff Garwood, Big Bay Brewing Co. co-founder and managing partner, the company has introduced its gourmet sodas in response to the growing interest in premium carbonated beverages made with innovative flavors, high-quality ingredients and natural sweeteners. In fact, the artisanal soda trend has gained enough momentum that Beverage World began covering up-and-coming developments in the category last year, adding it to its “Hit” list. With the hottest days of summer upon us, those looking for a natural thirst-quencher will enjoy Big Bay Pierjumper Twisting Citrus. Like “sunlight captured in a bottle,” the refreshing all-natural citrus beverage is the perfect choice any time of day – such as those precious last summer afternoons on the lake, or while enjoying an ocean sunset after a day at the beach. The hand-crafted quality flavors of Oh Buoy! Cherry Cola may remind the soda drinker of days-gone-by at an old-time beachfront soda fountain, and one might feel the urge to sip it through a red and white striped straw. But make no mistake, with a cherry finish and a hint of spice, this is an all-natural contemporary take on cherry sodas. It can be enjoyed anytime and anywhere a soda drinker is looking for sparkling refreshment in a bottle whether sitting along the banks of a favorite river, lake or stream; or in the backyard watching the kids play in the sprinkler. The Big Bay sodas have been available for sampling at the Big Bay tasting room for several weeks and the company has received positive consumer feedback. During product sampling, consumers have come up with some interesting thoughts on mixing the Big Bay gourmet sodas with the company’s craft beers. 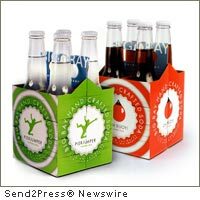 Throughout the soda development process the company founders believed the Pierjumper Twisting Citrus soda would partner well with the brand’s award-winning Wavehopper Kolsch Style Ale® to create a version of the German Radler-type drink – a lighter alcoholic beverage typically made by mixing equal parts of beer with a citrus soda or carbonated lemonade. (The proportions of the two ingredients can be altered according to taste.) Consumer feedback reinforces it as a refreshing choice for a long, hot summer afternoon or any time a beer drinker might be looking for a lighter option. Another interesting mixing idea from Big Bay Brewing consumers has been to partner Oh Buoy! Cherry Cola with Big Bay Boatilla Amber Ale®. “We’ve been pleasantly surprised at the innovative ideas our consumers have brought to us for mixing our gourmet sodas and craft beers; and we see them as a way to provide even greater variety to beer drinkers looking for a lighter alternative or a different flavor profile,” added Garwood. Big Bay Brewing Co. gourmet sodas are currently available in four-packs of 12-ounce bottles at select retailers across the state, as well as at the Big Bay Tasting Room and Brewery Store, located at 4517 N. Oakland Avenue in Shorewood, Wis. They will also be available individually at select restaurants, coffee shops and cafes. The suggested retail price will be $3.99 to $4.19 for a four-pack. Big Bay sodas are developed in agreement with Black Bear Bottling Group, LLC of Oak Creek, Wis., and are sold by local distributors across Wisconsin, including CJW Inc., Lee Beverage of Wisconsin, Kay Distributing, Webb & Gerritsen Inc. and Zastrow the Beer Man. Based in Shorewood, Wis., Big Bay Brewing Co. produces specialty hand-crafted beers and gourmet sodas. Big Bay is built with the vision that life on the water is a little sweeter, and that sweet life is infused in every Big Bay beverage. Big Bay’s founders believe that craft brewed beverages and life on the water go hand-in-hand. Life on the water means creating moments that turn into memories to be cherished for a lifetime. And, what better way to enhance those moments than with the right beverage. For more information, visit www.BigBayBrewing.com . Follow us on Facebook and on Twitter at http://twitter.com/bigbaybrewing . – Image Caption: Pierjumper Twisting Citrus and Oh Buoy! Cherry Cola from Big Bay Brewing Co.
Big Bay Brewing Company Milwaukee Wisconsin MILWAUKEE, Wis.
Alternate Headline: New Hand-Crafted Gourmet Sodas announced by Big Bay Brewing Co.